Synvisc-One® (hylan G-F 20) is an elastoviscous high molecular weight fluid containing hylan A and hylan B polymers produced from chicken combs. Hylans are derivatives of hyaluronan (sodium hyaluronate). Hylan G-F 20 is unique in that the hyaluronan is chemically crosslinked. Hyaluronan is a long-chain polymer containing repeating disaccharide units of Na-glucuronate-N-acetylglucosamine. Do not inject Synvisc-One in the knees of patients having knee joint infections or skin diseases or infections in the area of the injection site. Do not inject Synvisc-One extra-articularly or into the synovial tissues and capsule. Intravascular injections of Synvisc-One may cause systemic adverse events. The safety and efficacy of Synvisc-One in locations other than the knee and for conditions other than osteoarthritis have not been established. The safety and effectiveness of the use of Synvisc-One concomitantly with other intra-articular injectables have not been established. Use caution when injecting Synvisc-One into patients who are allergic to avian proteins, feathers or egg products. The safety and efficacy of Synvisc-One in severely inflamed knee joints have not been established. STERILE CONTENTS. The syringe is intended for single use. The contents of the syringe must be used immediately after its packaging is opened. Discard any unused Synvisc-One. Do not use Synvisc-One if package is opened or damaged. Store in original packaging (protected from light) at room temperature below 86°F (30°C). DO NOT FREEZE. Remove any synovial fluid or effusion before injecting Synvisc-One. Synvisc-One should be used with caution when there is evidence of lymphatic or venous stasis in the leg to be injected. Mild to moderate pain, swelling and/or effusion of the injected knee have been reported in clinical trials that were related to intra-articular injection of Synvisc-One. These events were typically transient and usually resolved on their own or with conservative treatment. As with any invasive joint procedure, it is recommended that the patient avoid strenuous activities (for example, high-impact sports such as soccer, tennis or jogging) or prolonged weight-bearing activities for approximately 48 hours following the intra-articular injection. The patient should consult his or her physician regarding the appropriate time to resume such activities. Pregnancy: The safety and effectiveness of Synvisc-One have not been established in pregnant women. Nursing mothers: It is not known if Synvisc-One is excreted in human milk. The safety and effectiveness of Synvisc-One have not been established in lactating women. Pediatrics: The safety and effectiveness of Synvisc-One have not been established in pediatric patients. Pediatric patients are defined as patients ≤ 21 years of age. A complete list of the frequency and rate of adverse events identified in the clinical study are provided in the Safety section (Table 3). A complete list of the frequency and rate of adverse events identified in the clinical study are provided in the Safety section (Table 2). SYNVISC® (3-injection regimen) post-marketing experience has identified the following systemic events to occur rarely with administration: rash, hives, itching, fever, nausea, headache, dizziness, chills, muscle cramps, paresthesia, peripheral edema, malaise, respiratory difficulties, flushing and facial swelling. There have been rare reports of thrombocytopenia coincident with SYNVISC (3-injection regimen) injection. Hypersensitivity reactions including anaphylactic reaction, anaphylactoid reaction, anaphylactic shock and angioedema have been reported. To determine the safety and effectiveness of a single injection regimen of Synvisc-One in the reduction of the pain score in osteoarthritis of the knee, a prospective, randomized, double-blind, 2-arm (parallel group) clinical trial in 21 centers in six European countries was conducted. A total of 253 patients were randomly assigned to study treatment; 123 received 6 mL of Synvisc-One and 130 received 6 mL of Phosphate-Buffered Saline. Neither the patients nor the clinical observers knew the patients' treatment allocations. The outcome measures collected included the Western Ontario and McMaster Universities Osteoarthritis Index (WOMAC; Likert 3.1 A version); patient global assessment (PTGA); clinical observer global assessment (COGA); and use of rescue analgesic (see Treatment and Evaluation Schedule). 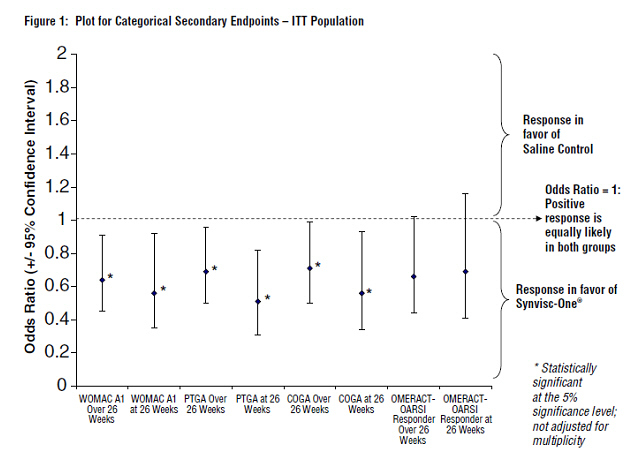 The intent-to-treat (ITT) population (all patients randomized) was used for the primary analysis. The primary efficacy analysis was a comparison over 26 weeks between the two treatment groups of change from baseline in the WOMAC A (Pain) Subscale (see Patient Population and Demographics), performed by analysis of covariance (ANCOVA). Table 1 summarizes the demographics and baseline characteristics. There were no clinically meaningful differences between treatment groups in any baseline parameter. Patients were followed for 26 weeks. Study visits were scheduled for screening, baseline, and weeks 1, 4, 8, 12, 18 and 26. Injections were performed aseptically at the baseline visit after arthrocentesis to withdraw any effusion or synovial fluid present. Patients were not permitted to take long-acting NSAIDs (including cyclo-oxygenase II inhibitors), opioid analgesics or corticosteroids (by any route) during the study, but were permitted to take up to 4 g per day of acetaminophen as needed for "rescue" of injected knee pain. "Rescue" medication was not permitted within 48 hours of any study visit. Injected knee assessment, patient and clinician global assessments (PTGA & COGA), WOMAC and safety evaluations were performed at each study visit. If patients in either blinded treatment group had at least mild pain in the injected knee at the week 26 visit (and did not experience any significant clinical concerns after the first treatment administration), they were offered an injection of (open-label) Synvisc-One. Those who chose to receive the second injection were followed for 4 weeks for safety only. The frequency and type of adverse events (AEs) were similar between the group of patients that received Synvisc-One and the group that received saline control. Initial Treatment Phase: The overall proportions of patients with Treatment-Emergent AEs regardless of device relatedness (Synvisc-One: n=70, 56.9%; Saline Control: n=79, 60.8%) and with injected knee AEs regardless of device relatedness (Synvisc-One: n=44, 35.8 %; Saline Control: n=44, 33.8 %) were comparable between the two treatment groups (See Table 2). Table 3 lists the incidences of AEs in the injected knee that were assessed by the investigator to be device-related, defined as related to either the study injection or the study treatment. Device-related AEs involving the injected knee were mild or moderate in nature and were treated symptomatically. There were no serious AEs in the injected knee in either the Synvisc-One or the saline control group. Repeat Treatment Phase: The repeat treatment phase evaluated the safety profile of the initial phase of patients receiving a second injection of Synvisc-One. One hundred and sixty patients were treated during this phase of the study, of which 77 patients received a second injection of Synvisc-One. Of these 77 patients, 4 (5.2%) experienced five device related AEs in the injected knee. All such events were mild to moderate and were treated symptomatically. These events were arthralgia (n=2), arthritis (n=1), injection hematoma (n=1) and injection site pain (n=1). Patients who developed injected knee AEs during the initial phase of the study, and who subsequently received repeat treatment, did not experience injected knee AEs upon repeat exposure to Synvisc-One. Overall Injected Knee Safety Summary: The safety profile of Synvisc-One is similar to the Clinical and Post-marketing experience seen with SYNVISC (3 injection regimen) where pain, swelling and effusion were the most frequently occurring AEs in the injected knee. Cases of acute inflammation, characterized by joint pain, swelling, effusion and sometimes joint warmth and/or stiffness, have been reported following an intra-articular injection of Synvisc-One. Analysis of synovial fluid reveals aseptic fluid with no crystals. This reaction often responds within a few days to treatment with Non Steroidal Anti Inflammatory Drugs (NSAIDs), intra-articular steroids and/or arthrocentesis. Clinical benefit from the treatment may still be apparent after such reactions. Overall 101 patients (Synvisc-One: n=47, 38.2%; Saline Control: n=54, 41.5%) experienced at least one AE outside the injected knee regardless of device relatedness. The most commonly occurring (5 % or greater in either group) AEs outside the injected knee were headache, back pain, nasopharyngitis and influenza. In the Synvisc-One group there was one AE of syncope considered device-related. No new systemic AEs were identified during this study as compared to SYNVISC. 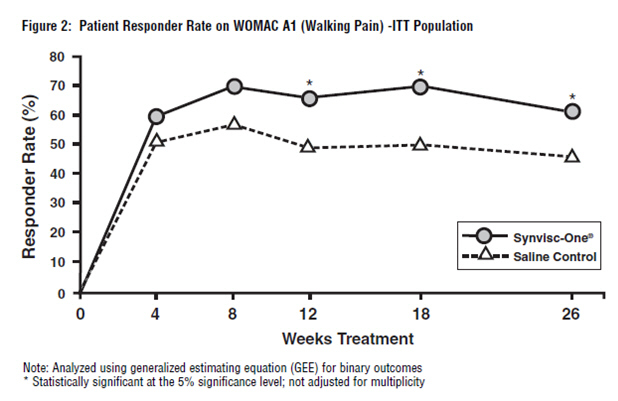 The primary endpoint for the study, the difference between the treatment groups in change from baseline over 26 Weeks in the WOMAC A Pain Score (Table 4) was met. Synvisc-One also demonstrated superiority to saline control in multiple pre-defined secondary outcome measures, which included PTGA over and at 26 weeks, COGA over and at 26 weeks, and pain while walking on a flat surface (WOMAC A1) over and at 26 weeks (see Figure 1 and Table 5). The WOMAC A1 responder rate (where response was defined as a 1-or-more category improvement from baseline and the patient did not withdraw from the study) was significantly higher in the Synvisc-One group than in the saline control group. Seventy-one percent (71%) of the patients were responders at week 18 in the Synvisc-One group (versus 54% in the saline control group). At week 26, 64% of patients in the Synvisc-One group were responders, while only 50% of patients in the saline control group were responders. Synvisc-One is supplied in a 10 mL glass syringe containing 3 doses (48 mg) of hylan G-F 20. The contents of the syringe are sterile and non-pyrogenic. Precaution: Do not use Synvisc-One if the package has been opened or damaged. Store in the original packaging (protected from light) at room temperature below 86°F (30°C). DO NOT FREEZE. Precaution: The syringe containing Synvisc-One is intended for single use. The contents of the syringe must be used immediately after the syringe has been removed from its packaging. Synvisc-One is administered as a single intra-articular. Strict aseptic administration technique must be followed. Using an 18- to 20-gauge needle, remove synovial fluid or effusion before injecting Synvisc-One. Do not use the same syringe for removing synovial fluid and for injecting Synvisc-One; however the same 18- to 20-gauge needle should be used. SYNVISC-ONE, SYNVISC and GENZYME are registered trademarks of Genzyme Corporation. Non-steroidal anti-inflammatory drugs: also known as "NSAIDs"; medication used to treat pain or swelling. There are many examples of NSAIDs, including (but not limited to) aspirin and ibuprofen. Some of these are over-the-counter drugs, and some can only be obtained by prescription. -What is the Synvisc-One® product? -How is the Synvisc-One® product given? -What should my doctor warn me about? -What are the risks of getting a Synvisc-One® injection? -What are the benefits of getting a Synvisc-One® injection? -What do I need to do after I get Synvisc-One® injection? -What other treatments are available for OA? -What adverse events were observed in the clinical study? What is the Synvisc-One® product? Synvisc-One is a gel-like mixture that comes in a syringe containing 6 mL (1 ½ teaspoon) and is injected into your knee. It is made up of hylan A fluid, hylan B gel, and salt water. Hylan A and hylan B are made from a substance called hyaluronan (pronounced hy-al-u-ROE-nan), also known as sodium hyaluronate that comes from chicken combs. Hyaluronan is a natural substance found in the body and is present in very high amounts in joints. The body's own hyaluronan acts like a lubricant and a shock absorber in the joint and is needed for the joint to work properly. Synvisc-One is indicated for the treatment of pain in osteoarthritis (OA) of the knee in patients who have failed to respond adequately to conservative non-pharmacologic therapy and simple analgesics, e.g., acetaminophen. How is the Synvisc-One® product given? Your doctor will inject Synvisc-One into your knee. Should not be used in patients who have had any prior allergic reactions to SYNVISC, Synvisc-One or any hyaluronan-based products. Signs of an allergic reaction may include swelling of your face, tongue, or throat; difficulty breathing or swallowing; shortness of breath; wheezing; chest pain; a tightness in your throat; sleepiness; rash; itching; hives; flushing; and/or fever. Should not be used in patients with a knee joint infection, skin disease or infection around the area where the injection will be given. Synvisc-One is only for injection into the knee, performed by a doctor or other qualified health care professional. Synvisc-One has not been tested to show pain relief in joints other than the knee. Synvisc-One has not been tested to show better pain relief when combined with other injected medicines. Synvisc should be used with caution when there is evidence of lymphatic or venous stasis in the leg to be injected. Synvisc-One has not been tested in pregnant women, or women who are nursing. You should tell your doctor if you think you are pregnant, or if you are nursing a child. Synvisc-One has not been tested in children (≤ 21 years of age). What are the risks of getting a Synvisc-One® injection? The side effects (also called reactions) sometimes seen after any injection into the knee, including Synvisc-One, include: pain, swelling, heat, redness, and/or fluid build-up around the knee. These reactions are generally mild and do not last long. Reactions are generally treated by resting and applying ice to the injected knee. Sometimes it is necessary to give pain relievers by mouth such as acetaminophen or NSAIDs, or to give injections of steroids, or to remove fluid from the knee joint. Patients rarely undergo arthroscopy (a surgical inspection of the knee joint) or other medical procedures related to these reactions. Other side effects seen with SYNVISC or Synvisc-One are: rashes, hives, itching, muscle pain/cramps, flushing and/or swelling of your face, fast heart beat, nausea (or feeling sick to your stomach), dizziness, fever, chills, headache, difficulty breathing, swelling in your arms and/or legs, prickly feeling of your skin, and in rare cases a low number of platelets in the blood (platelets are a type of blood cell that are needed to help your blood clot when you are cut or injured). Allergic reactions, some which can be potentially severe, were observed during the use of Synvisc-One. Rare cases of knee joint infection have been reported after SYNVISC injections. If any of the above side effects or symptoms appear after you are given Synvisc-One, or if you have any other problems, you should call your doctor. What are the benefits of getting a Synvisc-One® injection? As shown in a medical study of 253 patients with osteoarthritis (OA) of the knee, where approximately half received either a single injection of Synvisc-One or an injection of the same volume of salt water (a "Saline Control" injection), the major benefits of Synvisc-One are pain relief and improvement in other symptoms related to OA of the knee. What do I need to do after I get Synvisc-One® injection? It is recommended you avoid strenuous activities (for example, high-impact sports such as tennis or jogging) or prolonged weight-bearing activities for approximately 48 hours following the injection. You should consult your doctor regarding the appropriate time to resume such activities. If any of the side effects or symptoms described above appear after you are given Synvisc-One, or if you have any other problems, you should call your doctor. A study was conducted in 6 countries outside the United States with 21 physicians. The patients in the study had mild to moderate knee OA, moderate to severe pain, and did not have sufficient relief of their pain and symptoms with medications taken by mouth. A total of 253 patients in the study were assigned by chance to receive either a single injection of Synvisc-One (n=123 patients), or an injection of the same volume of salt water (a "Saline Control" injection) (n=130 patients). Neither the patients nor the doctors evaluating them knew which treatment they received. Any fluid that was present in the patient's knee was removed before the injection. The patients were seen by their doctor at standard times over 6 months. Information was collected about how much pain they were experiencing doing various types of activities, how much they were limited in their daily activities by their OA, and on their overall condition. Their doctor also provided an overall rating of their OA. The main measure of the study was how much pain the subjects had doing five common types of activities over the 6 months duration of the study. Daily activity limitations and overall evaluations were also compared between the group of patients receiving Synvisc-One injection and the group receiving salt water injection. The study showed that patients receiving Synvisc-One had significantly less pain over 6 months, and felt significantly better than the patients who received the salt water injections. The difference in pain score reduction from baseline to 6 months between the Synvisc-One and salt water control injection was 0.15 out of a 5 point scale for the measurement of OA pain in the knee. What adverse events were observed in the clinical study? Severe adverse events were not observed in the Synvisc-One trial. Joint infections did not occur in the injected knee in the Synvisc-One clinical trial. The most commonly occurring adverse events outside of the injected knee were headache, back pain, sore throat and the flu. One patient had a single episode of feeling faint. If you have any questions or would like to find out more about Synvisc-One, you may call Genzyme Biosurgery at 1-888-3-SYNVISC (1-888-379-6847) or visit www.synvisc.com. Note: Patients are counted once for each unique AE regardless of device relatedness, and may have had more than one unique AE. Note: Patients are counted once for each unique AE, and may have had more than one unique AE. Repeated measures Analysis of Covariance was used for the WOMAC A pain score change from the baseline. 26 weeks 0.64† The odds (probability [Worse] / Probability [Better]) for Synvisc-One for over 26 weeks and at 26 weeks is approximately 64%, and 56%, respectively, to the odds for control. Synvisc-One patients were 1.56 times more likely to self-report pain relief while walking on a flat surface compared to those patients treated with saline control over 26 weeks and 1.79 times more likely to self-report pain relief while walking on a flat surface compared to those patients treated with saline control at 26 weeks. PTGA Over 26 weeks 0.69† The odds (probability [Worse] / Probability [Better]) for Synvisc-One for over 26 weeks and at 26 weeks is approximately 69% and 51%, respectively, to the odds for control. PTGA: Patient Global Assessment has 5 scales (Very well, Well, Fair, Poor, Very poor) Synvisc-One patients were 1.45 times more likely to self-report improvement in overall health status compared to those patients treated with saline control over 26 weeks and 1.96 times more likely to self-report improvement in overall health status compared to those patients treated with saline control at 26 weeks. COGA Over 26 weeks 0.71† The odds (probability [Worse] / Probability [Better]) for Synvisc-One for over 26 weeks and at 26 weeks is approximately 71%, and 56%, respectively, to the odds for control. COGA: Clinical Observer Global Assessment has 5 scales (Very well, Well, Fair, Poor, Very poor) Blinded clinical observers were 1.41 times more likely to assess patients treated with Synvisc-One as showing overall improvement in disease status compared to those patients treated with saline control over 26 weeks and 1.79 times more likely to assess patients treated with Synvisc-One as showing overall improvement in disease status compared to those patients treated with saline control at 26 weeks. OMERACT-OARSI Responder Over 26 weeks 0.66 This response analysis did not reach statistical significance between, the treatment groups. WOMAC C Over 26 weeks -0.18 The study did not show a statistically significant difference in functional improvement between the treatment groups.